CLEVELAND (CNS) — When Msgr. Kieran Harrington delivered the invocation on the opening night of the Republican National Convention, it wasn’t just a coincidence that he ended up on the same stage where high-scale politics would dominate for four days. 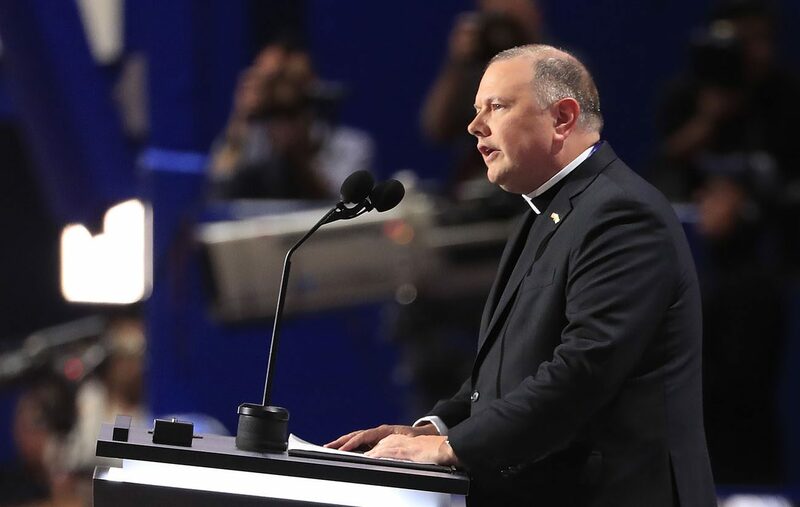 The priest from the Diocese of Brooklyn, New York, told Catholic News Service that he worked for the Republican National Committee for five years in the 1990s and was known to some of the party’s highest-ranking officials. The process was not planned far in advance and his on-stage appearance was finalized only days before the convention began, he said. Things happened so quickly that Msgr. Harrington ended up driving from Brooklyn to Cleveland, arriving at 3 a.m. July 18, about 17 hours before offering the prayer. “The way I look at it is I’m here to bring the Gospel. It’s very important to hold up a mirror to let people know what their deliberations really are about,” said Msgr. Harrington, chairman of the DeSales Media Group in the diocese and pastor of the Co-Cathedral of St. Joseph in Brooklyn. The invitation came after he inquired about the status of press credentials for the staff of the diocese’s New Evangelization Television cable TV network. Msgr. Harrington received a call from Sean Spicer, communications director and chief strategist for the Republican National Committee, who not only confirmed the credentials, but invited the priest to offer the prayer. Msgr. Harrington cleared the request with Brooklyn Bishop Nicholas DiMarzio and began coordinating his short appearance at the convention. Aside from Bishop DiMarzio, few knew about Msgr. Harrington’s part at the convention until he told St. Joseph parishioners at Masses the weekend of July 16-17. “I told them, ‘I don’t want you to be surprised. You may see my on TV. I want to tell you I believe you bring the Gospel everywhere and anywhere,'” he recalled. “To me, the good Samaritan was important especially because, I think, of the great issues our country faces. The perennial issues on human life. To me, I don’t think there is any way around saying this is the greatest evil our nation is engaged with at the moment. To take the life of child in the womb is barbaric,” he said. “At same time, as people who stand for human life, we understand life begins at conception, but it doesn’t end when the child is born. There are people who are vulnerable and who are here in this country and are strangers. To my mind I wanted to hold that up because the rhetoric can be un-neighborly to say the least,” Msgr. Harrington told CNS. Msgr. Harrington’s career in politics lasted from 1994 to 1999. It began when he decided to take a year off from studying for the priesthood. He wanted to get a job and better understand the lives of people who go to work day in and day out so he could be a better priest. He joined the RNC doing research and working in campaign operations. One year stretched to five as he took on more responsibilities and became an aide to Jim Nicholson, then-party chairman, who later became U.S. ambassador to the Holy See and then secretary of Veterans Affairs. Msgr. Harrington said today that he is a registered Democrat, but he did not offer any reason for his change in political allegiance.